Today we are going to be taking a look at one of the latest offerings by Logitech, The Cordless Desktop Wave. The Wave brings several nice features to the table with it at a moderate price of 89.99 USD. The keyboard is designed to offer optimal comfort for those that prefer an ergonomically styled keyboard. 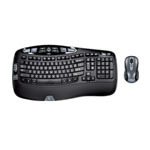 The laser mouse offers contoured sides and both the keyboard and mouse utilize soft rubber pads / grips.